we say. We did something that caused someone pain. It almost grates doesn’t it? If someone says they forgive us, it means they agree that we did them some harm. There was something that needed forgiving. We’re much better at denial. It’s okay, really. No problem. Forget about it. 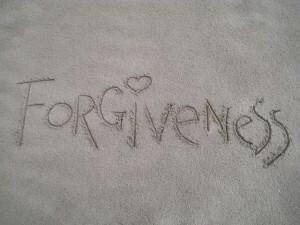 Forgiveness is actually a difficult topic, whether we are thinking about our relationships with each other or with God. 56 Q. What do you believe concerning “the forgiveness of sins”? Well there are lots of possibilities. If I were writing the Catechism I would talk about “debts.” And that is not just because Presbyterians say “forgive us our debts” when we say the Lord’s Prayer. My answer goes to the parable in Matthew 18:23-35. Christ talks about debts and forgiveness. One guy owes his master a vast unpayable sum. His master is about to throw him into debtors prison. The servant asks for mercy. The master relents and “forgives” him of the debt. So here forgiveness is when you have a debt, but the person you owe it to does not make you pay. We owe God something. God has mercy and forgives us — that is, God does not make us pay up what we owe for our sins. One can also approach forgiveness as healing of a broken relationship. One of the Catechism’s footnotes hints this direction. It cites 1 Cor. 5: 19 & 21, where the issue is reconciliation. And I have to say, thinking of Christ’s work being about the healing of a broken relationship speaks powerfully to me. It says something rich about the “why” of forgiveness. But the Catechism goes another direction. It isn’t surprising, considering the emphasis found in the earlier material on the natures of Christ and the cross: the classic western atonement category of “satisfaction. or my sinful nature which I need to struggle against all my life. to free me forever from judgment. The footnotes show me how the authors in 1563 were rooting their emphasis in Scripture: they cite 1 John 2:2 where forgiveness is grounded in Christ’s atoning sacrifice. It is more surprising when the catechism says God’s forgets my sins and my sinful nature. The footnote points first to Jeremiah 31:34, which does explicitly support the point. But isn’t it an odd point? It sounds a bit like God has Alzheimers: are we reconciled only because God forgot the problem that had divided us in the first place? Forgetting doesn’t solve every problem. When I forget where I put my keys or my phone I focus all my attention on trying to find them again. The Jews annually remember the Exodus, calling to mind the ways God saved them so long ago. Christians are told by Christ to receive the Eucharist in remembrance. We call to mind Christ’s work, his grace, his love for us. So in Jeremiah, it is not so much that God can’t remember our sins. God won’t remember them. God will no longer call our sins to mind — because God doesn’t want to collect our debt or punish our offenses. And this is where the other biblical references in the footnote point: In Psalm 103 God takes our sins as far away as East is from West; in Romans 7 and 8 Christ releases us from the slavery and brings us to new life in freedom. The Catechism’s final assertion is that we forgiven sinners are given Christ’s own righteousness. More about that topic in later questions. When I was working on the PC(USA) special committee that worked on the new translation of the Catechism, I sort of fell in love with the footnotes. There are three footnotes on this question, and two of the three are extremely helpful in making sense of the meaning. Where the answer seems overly narrow, they point to a larger biblical understanding. Where the answer seems odd or problematic, they clarify the meaning. Those footnotes in the Catechism are always there to invite us to read Scripture for ourselves. And they are always worth reading.